Back in June, the president of France Emmanuel Macron (still working on my French on this) paid a visit to the New Afrikan Shrine in Lagos. Hosted by Trace Events and Ecobank and tagged A Celebration of African Cultures, it went down in the Shrine’s history as the first time a serving president graced the stage. That day, social media became a melting pot of buzzy, feverish observations, digitally curating Macron’s presence and activity. Bursting with personalities like the Lagos governor Akinwunmi Ambode, there was a slew of artistes present: Banky W, Cameroonian singer Charlotte Dipanda, Ara, the talking drum queen and Yemi Alade, whose music has been courting French-speaking listeners since her 2014 banger Johnny. 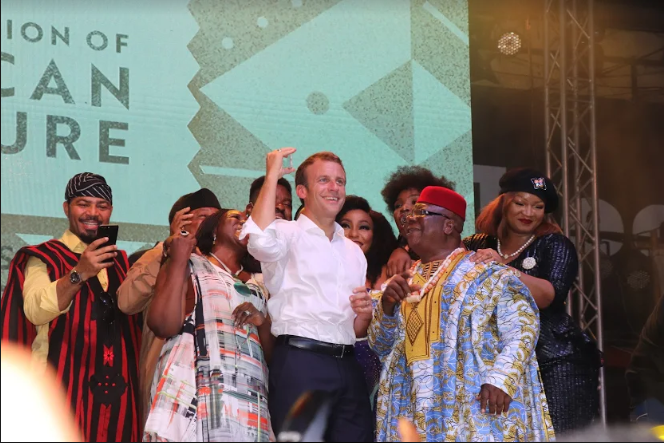 During the event, Macron spoke about an upcoming project involving African artistes, an event tagged Season of African Cultures which will take place in France in 2020. In other words: Coachella, but make it African. I still can’t get over the fact that Macron was an intern at the French Embassy in Nigeria, this he revealed himself to a crowd and that he visited the Shrine in 2002. If you missed the event like I did, Trace Naija will broadcast a one-hour special of Macron’s Shrine visit this Sunday at 8:30pm WAT on DStv channel 352. I’ll set a reminder, and you should too.